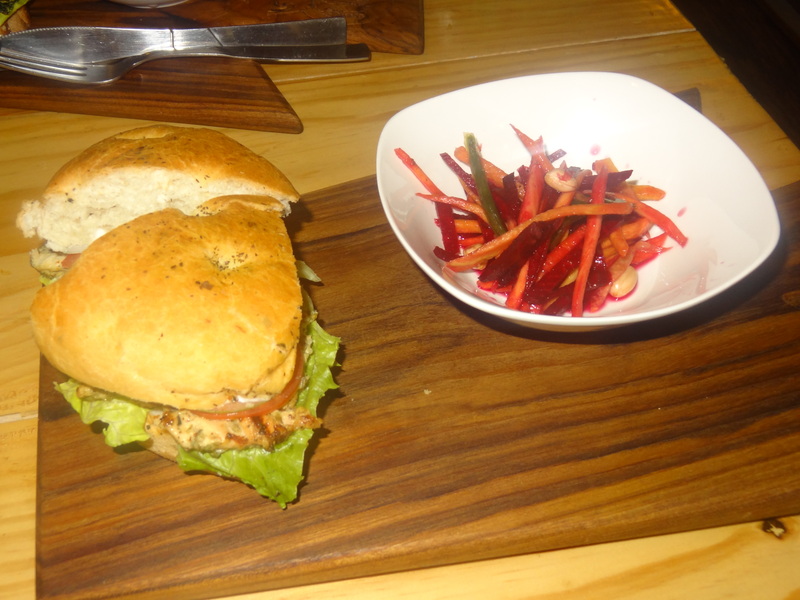 Healthy food & fine coffee that’s what I was looking for until found Farmout, a place in Galleria Market, Gurgaon. Farmout was started by 2 friends Arijit Ganguly & Amit Meena. You can call it a small cafe which smells heavenly of freshly baked cookies, coffee & sandwiches. It’s a reasonable & affordable place with a small live kitchen for quick service. The place started with a few items but now has around 20 kinds of coffees all fine & smooth with the taste of Blue Tokai Beans. This one is certainly the best in taste. The freshly grounded beans are roasted every week for making the best & superior blend, a pure organic rich coffee blend with fresh aromas of fine & rich coffee beans. 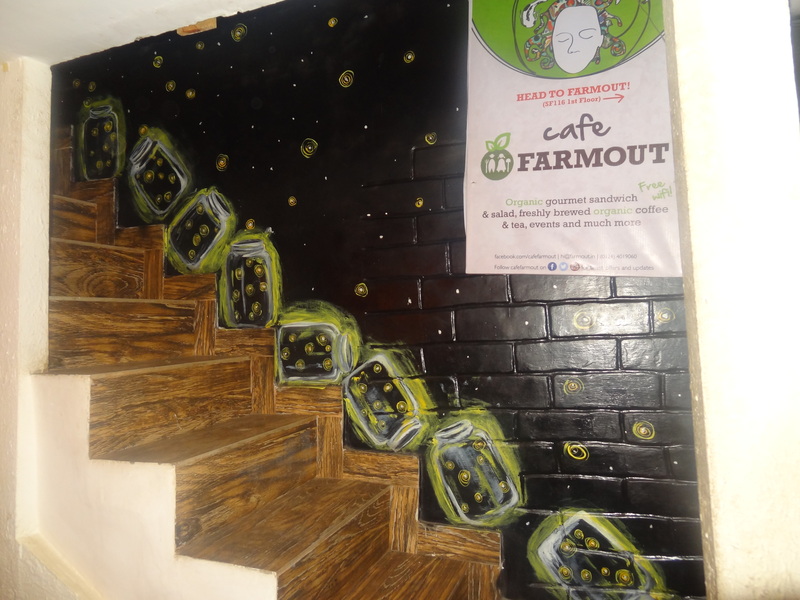 The concept Farmout is totally organic because the food is organic & fresh. Everything is healthy & low fat here. The cafe offers great coffees, sandwiches, salads & smoothies. They even offer home delivery through Pick & Go and Delhivery. It’s a farm fresh chill out concept of healthy eating & loved by mommies who call for special home deliveries for their little fussy ones from here. The very charming & polite Arijit Ganguly spoke about the breads being made by a friend and how his friend is in demand and so he has come out with more variety in the menu. Arijit mentioned that he was in the IT & Finance field and had this passion inside him for food so that’s how this cafe came up. 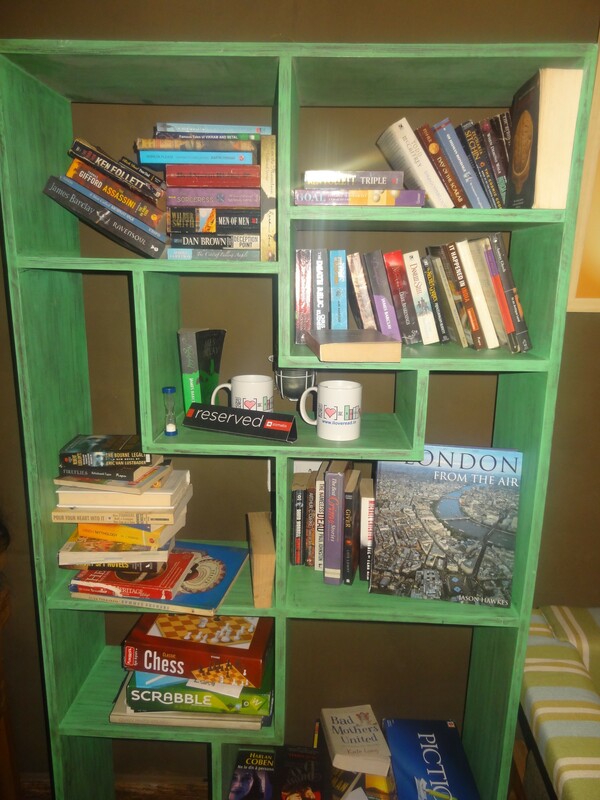 He also loves reading books as one could see his collection on the shelf. 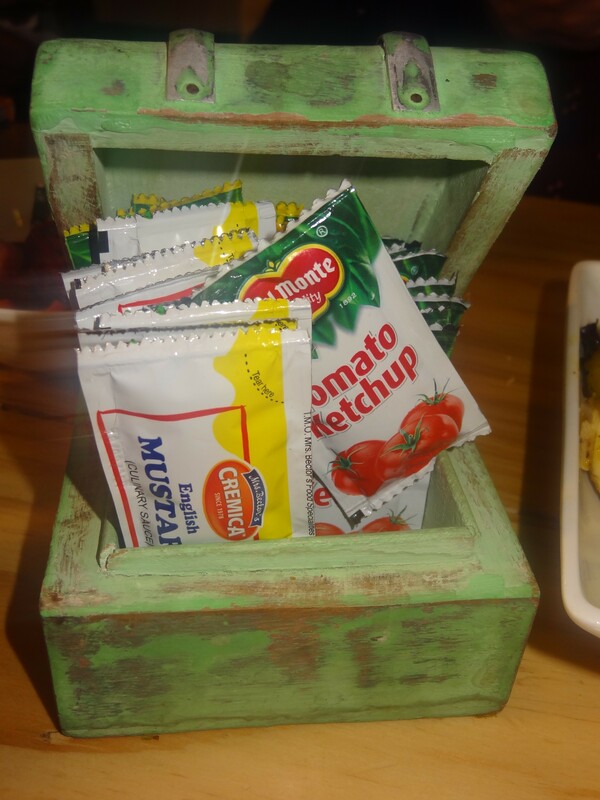 I loved the ocean green treasure box of sauces kept on the table. The roof was made with different door handles and lively colourful caricatures could be seen on the wall. 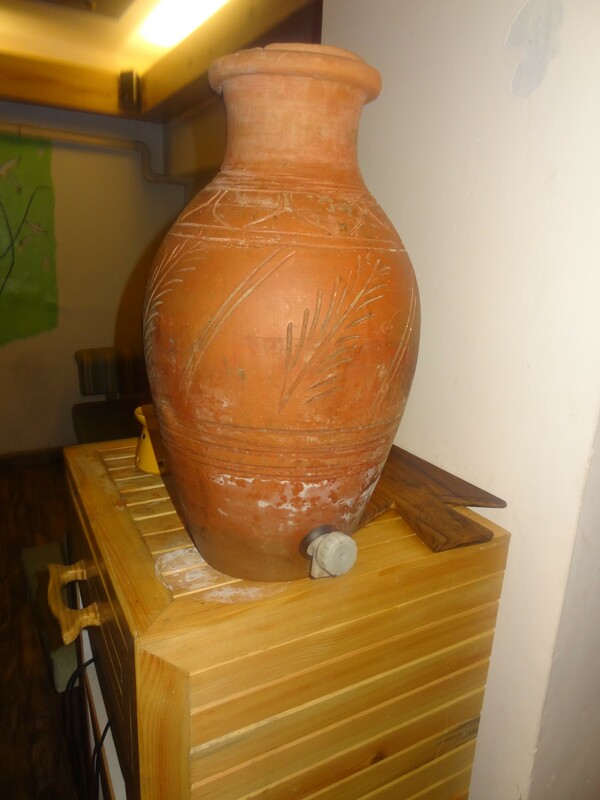 They also had a matka with a tap kept on one side and agricultural implements & spades on the wall depicting pure, fresh, organic vegetation giving his cafe a unique look. The cafe is designed by a 19 year old girl. 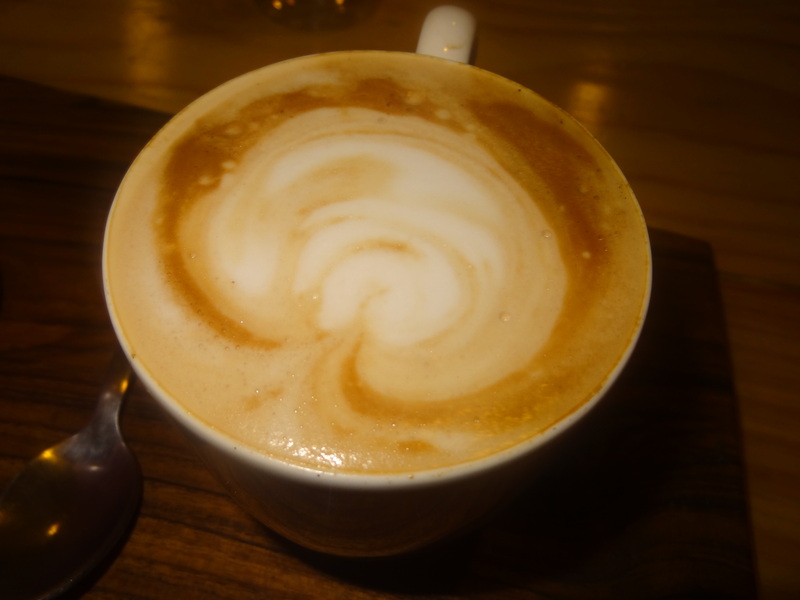 As for the food, we ordered a Hazelnut cappuccino which was good & smelt heavenly. The fresh flavour & aroma of great coffee beans could be felt. It’s totally a must have here as I am sure you will get addicted to the lovely fine taste after having it. I glanced at the menu munching on the low-fat cookies. 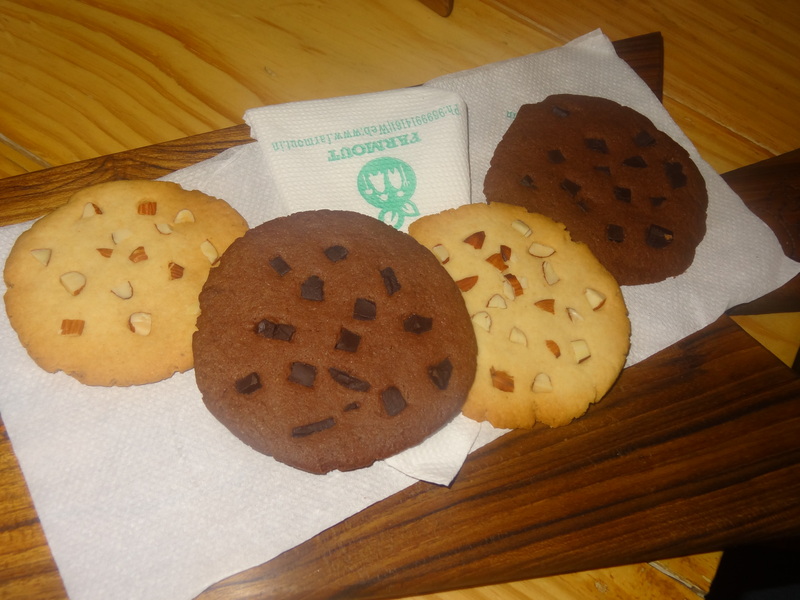 The cookies are available in 2 variants- Double Choco-chip and Vanilla & Almond cookies. They were made by a mentally challenged girl. Believe me the cookies were nice, soft & fresh as if out of the oven. They were totally amazing. Then came the Mediterranean Farmer Sandwich. It had roasted peppers (red, yellow, green), zucchini, broccoli, mushroom in honey mustard dressing topped with low fat cheese & served in focaccia bread. It was quite delicious with mixed flavours of all the healthy stuffing inside. The taste of honey mustard dressing melted in the mouth with every bite. 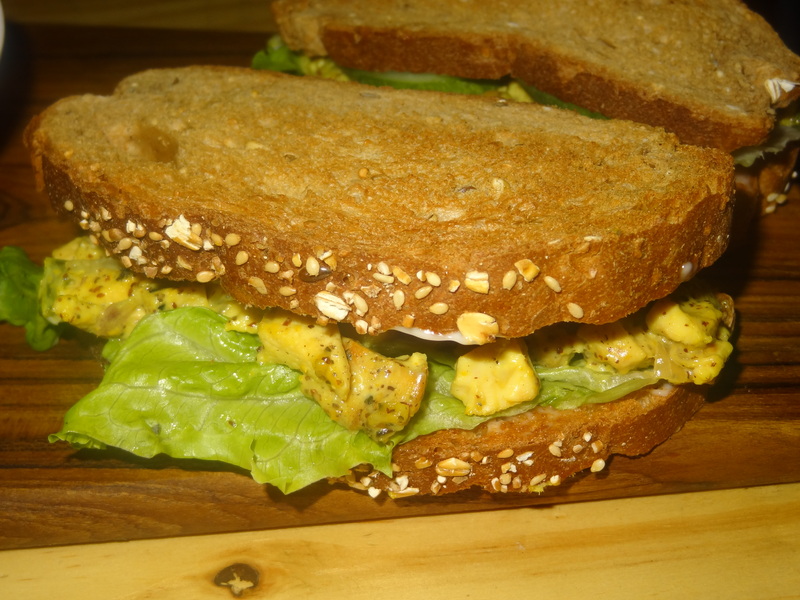 Then we tried the Requiem For a Chicken Sandwich which also happens to be Arijit’s favourite.It was a seamless combination of organic Kasundi mustard, pan seared chicken & celery in multigrain bread. The bread was soft, fresh & the mustard taste was rich & different but I loved the unique Bengali blending and I must say it’s a lovely treat for all the health enthusiasts. All the sandwiches are served with a side salad of beetroot, carrot, peanuts & capsicums all finely sliced & cut very thin in julienne. It was awesome & I simply loved it. It is so much healthier to have a sandwich with this instead of having a calorie dose of french fries. 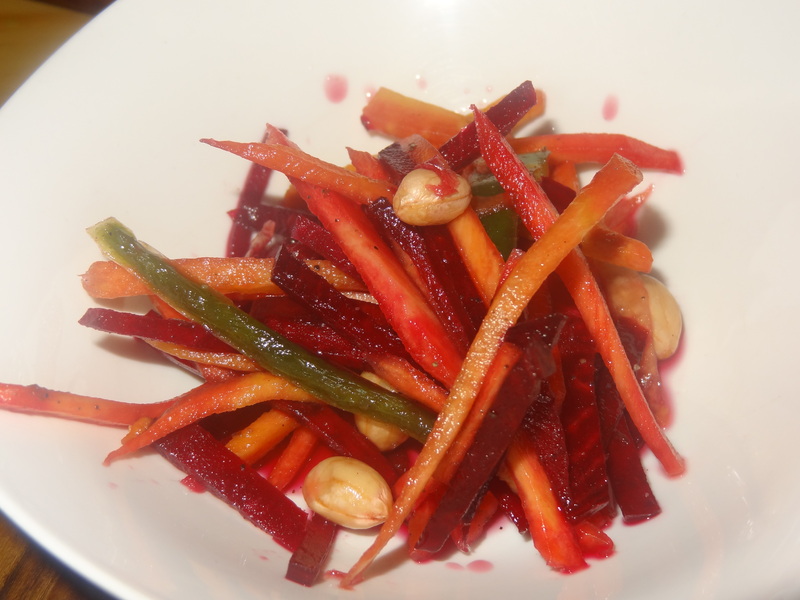 Here you get a rejuvenating dose of fresh beetroot & carrot serving. 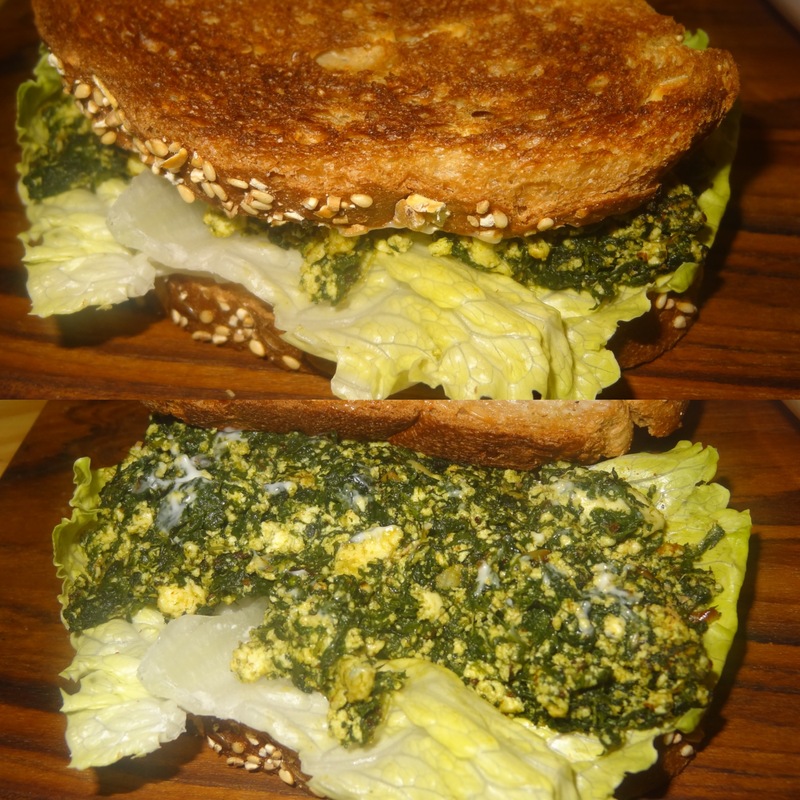 The Desi Popeye Sandwich was a sublime duet performance from Spinach & Paneer in an Indian spice base served in multi-grain bread. 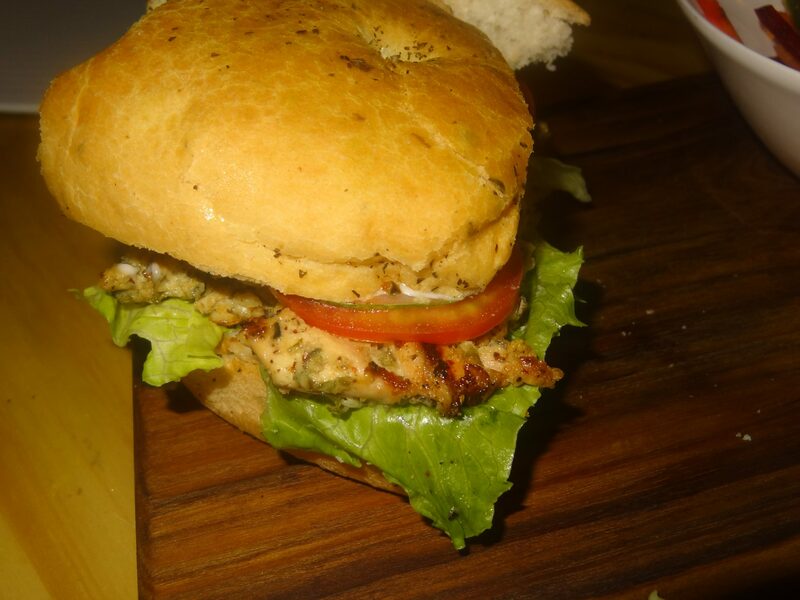 It was amazing with the bread slightly roasted and the mild marination of spices. It was a delight with the melting goodness of paneer & double nutrition of palak- a wholesome & lovely surprise. 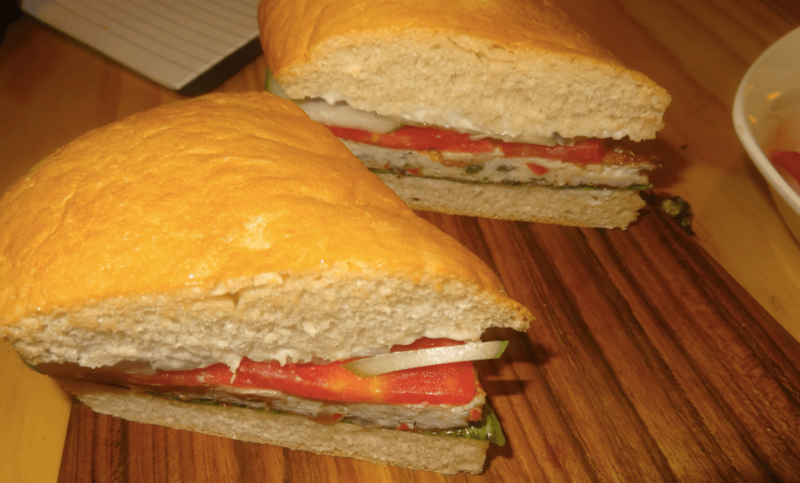 The Hipster Chicken Sandwich had juicy chicken with a bunch of rosemary & parsley and a hint of Worcestershire sauce & mustard served in focaccia bread. The chicken was juicy, fresh & had a very refreshing taste. A must try! 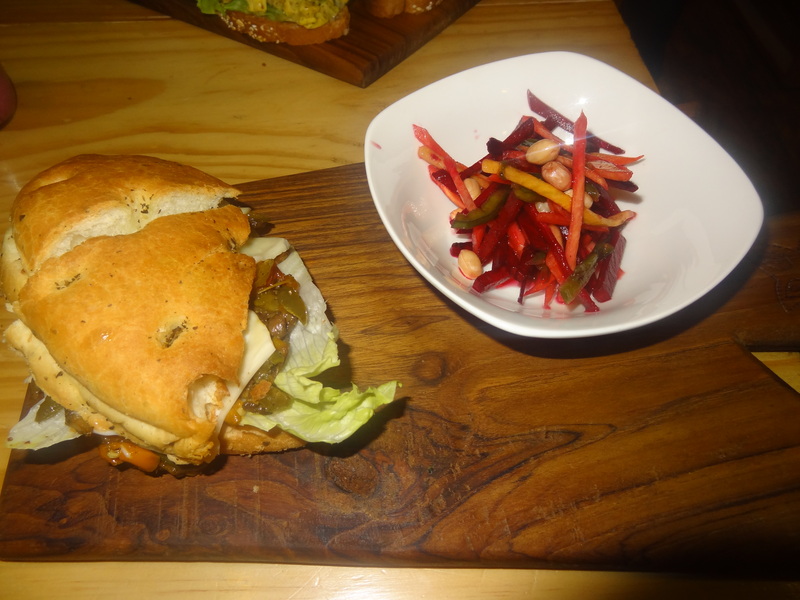 The Eggxotic Sandwich had two large eggs scrambled to perfection with onion, capsicum, red pepper & low fat cheese served in focaccia bread. It tasted lovely, refreshing & unique- the farm fresh & organic way. 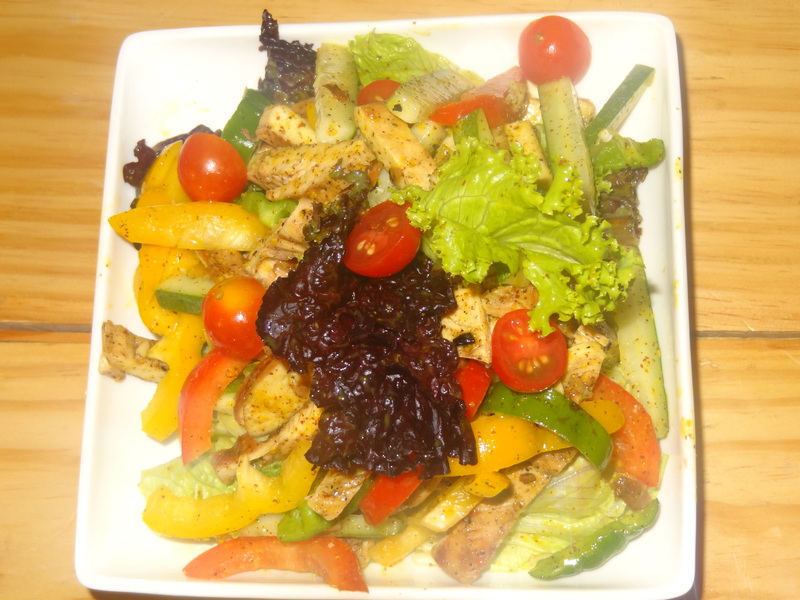 The Grilled Chicken Salad was totally garden fresh with juicy chunks of chicken marinated with a light organic honey mustard dressing, fresh lettuce, cherry tomatoes & all the garden greens tossed lightly. The honey mustard dressing was very refreshing & the taste just melted in the mouth. It was a very fulfilling & satisfying treat for the tastebuds. For my sweet temptations, I was longing for a Red Velvet & when I found it in the menu, my happiness knew know bounds as the Red Velvet was very soft, creamy, mushy & delicious. I also tried their Tiramisu which was creamy, fresh & refreshing. I liked it! So I loved my experience as I got to taste one of the best coffees and organic food items here, all of them energy giving & nutritious. I call it the FARMOUT Express or the REJUVENATION station as I felt so fresh & relaxed after eating the food. I did not feel lazy or sleepy at all as the lovely host Arijit tried every bit to keep all the flavours fresh & mild along with the lovely coffee taste which I still relish on my tastebuds. It’s a great, cozy, warm & friendly place for a stress-free, organic, healthy & relaxed eating any day.